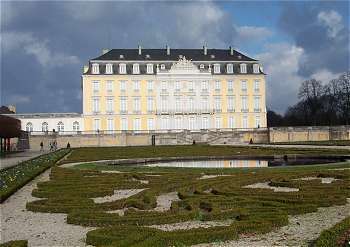 The Augustusburg and Falkenlust castles in Brühl are considered masterpieces of the rococo. They were developed in the 18th century for Clemens August, the archbishop and worldly ruler of Cologne. Construction of Augustusburg was started in 1725. First Johann Conrad Schlaun was appointed as architect, but August wanted something more modern and after 3 years hired Francois Cuvilliés. He made the castle into what it is now, with a lot of help of other artists like Balthasar Neumann who is responsible for the magnificent marble staircase. 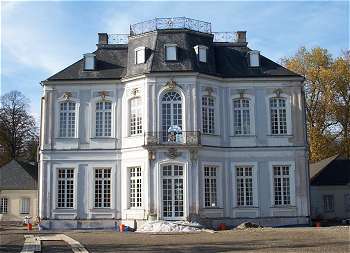 Nearby Falkenlust was built as a hunting castle. The responsible architects here were Cuviliés and Leveilly. Also worth mentioning is the garden of Augustusburg. It was designed in Versailles-style by the Frenchman Dominique Girard. Brühl is a little town near Cologne that is famous for its amusement park 'Phantasialand'. I drove 2,5 hours from my home to see the castles though. After I arrived I first did a guided tour of the Augustusburg Castle. There I learned about the mighty Clemens August, who ruled a large part of northwestern Germany in the 18th century. One of his hobbies, besides hunting, was building castles. It cost him so much money that after his death all the furniture had to be sold to pay the debts. But the fine rococo palaces are still standing. In Augustusburg you really should see the staircase, by which Clemens August meant to impress the humble visitors that came to see him. The other castle that is part of this world heritage site, Falkenlust, is being restored at the moment. It's a lot smaller, but in nice quiet surroundings. The small chapel in the woods to the right is also very pretty. Although they’re not nearly the most famous castles in Germany, the style of the buildings and, more importantly, the interior designs were to influence the creation of other princely courts for more than a century. They are extremely significant in terms of architecture and design of the 18th century and are worth visiting for anyone interested in those topics. 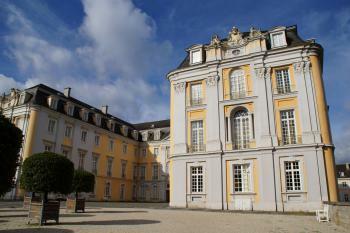 Both castles are close to each other and just short walks from the train station at Brühl. It is an easy trip from nearby Cologne and could be done quickly in an afternoon or morning – or as a more leisurely day trip. It is definitely worth seeing both castles and spending a bit of time in the surrounding gardens as well. Augustusburg Castle can only be seen as part of guided tour but Falkenlust Castle is open for you to explore at your own pace. It doesn’t matter which you see first but it might be a good idea to base that decision around when the next tour is starting. I found Brühl an unexpected delight, visiting on a sunny weekend in August 2015. Natalie and I had been to Zollverein the previous day, before spending a night in Cologne. Characterised by an abundance of detail and gaiety, these two Rococo buildings exhibit a light and intimately styled form of decoration. The highlight of this site is the grand staircase in the main Augustusburg residence, designed by Balthazar Neumann. He is the same architect who went on to create the grand staircase in Würzburg, which we visited on our annual lads’ trip earlier in the summer. The similarities are striking, but for my money Brühl comes out on top. We walked the path to the Falkenlust (German for falcon lodge). Falconry was the form of hunting that Clemens August favoured. He used his falcons to hunt for animals, but whatever the birds caught was subsequently let go. 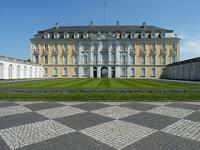 Whilst the Falkenlust is self-guided, the only way to see the interior of the Augustusburg palace is to go on a tour. Listening to an English audioguide whilst our German-speaking leader took us around, we saw a good number of the 120 rooms. The site’s Wikipedia page features only a couple of paragraphs and some dreary photographs of the palace taken in the rain. Because of this I wasn’t expecting a great deal of my visit, but I came away thinking it was one of the best World Heritage Sites I have been to! I visited this WHS on a sunny day in May 2013. The castle of Augustusburg alone is already worth the visit. Then there are never-ending and well kept gardens to explore and enjoy. The hunting lodge of Falkenlust is quite a walk a way, so should it be rainy I'd suggest driving to its entrance instead of walking. A very pleasant WHS to visit. Just to tick off another WHS on the list, I thought when I started my half day trip from Cologne to Brühl. And to see where for several decades the German presidents received their state guests. Augustusburg was built as a summer residence and hunting lodge for the Archbishop of Cologne and Prince Elector Clemens August. As expected, there was the usual sequence of state rooms as it can be seen in many similar palaces, with furniture, chandeliers, Chinese wallpapers, opulent decorations etc. The most impressive part is undoubtedly the staircase by Johann Balthasar Neumann. The abundant stucco, the sculptures and the precious marble columns appear a bit overdone, but still elegant and harmonious. After a short walk through the well-kept garden and the forest I reached the Falkenlust hunting lodge. Again, the highlight was the staircase, it is decorated from floor to ceiling with Dutch tiles. 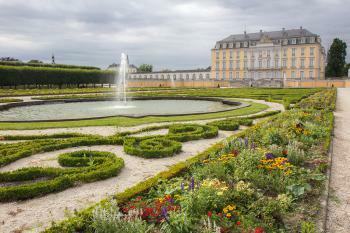 Both palaces and the garden are excellent examples of the Rococo style. All in all, it was a worthwhile trip and I've enjoyed my visit more than I expected. 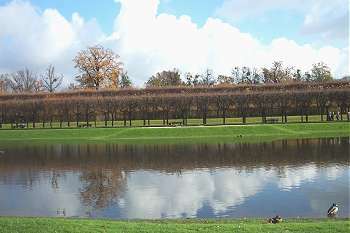 The guided tour in Augustusburg takes about 45 minutes, Falkenlust can be visited with an audioguide. 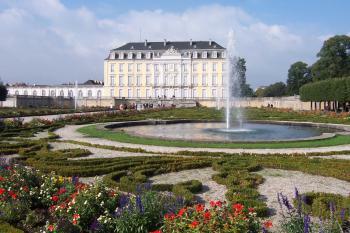 Brühl is just a short train ride from Cologne, the entrance to the palace is opposite the railway station. 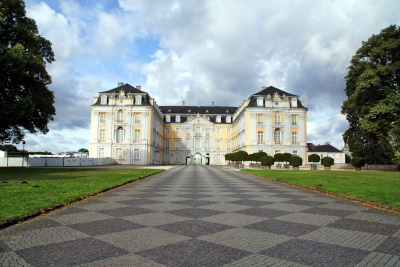 The Augustusburg was simply an amazing castle, with elaborate design and lavish furnishing. Even though much of the furniture were not the original, it was still a beautifully restored castle. It is easy to get to Augustusburg because it is just a few hundred metres away from the Bruhl station. The combination ticket, along with the Falkenlust cost 7 euros. To visit the Augustusburg, a guided tour is compulsory for any entry. Guide only speaks German but there are audio guides in various languages. However, German listeners get to enjoy a deeper and more interesting tour. Falkenlust is a good 2 miles away or almost an hour walk. The distance seems to be longer than it sounds, after passing through the gardens, forest walk and passing through some farmland. Care has to be taken because no clear signage is available and it is not clearly marked on the google map, except for the path Falkenluster Allee for some clues. Otherwise, ask some of the park strollers passing along. No direct transportation, except maybe taxis, is available, which is quite disappointing. From here, another half day trip can be taken to visit the nearby Aachen Cathedral, by changing trains in Cologne. For the following day, half a day trip up north to Zollverin Coal Mine at Essen can be taken. Probably take Cologne as the base, and for two nights, including the Cologne Cathedral, 4 amazing and quite different world heritage sites can be visited. Do get the regional train pass if traveling in a group of 2 or more. Totally worth it and affordable. If you want to take a break from the grandeur and majesty of Cologne cathedral, go to the train station next door and take the 15 minute, 3.5 Euro local train to Bruehl to visit this site. This being high Rococco is so overdone that I wondered if it done as a parody of the period. it is as if someone took the 50 rooms of Schonnbrunn and jammed into the 20 rooms the here. The grand staircase is filled with sculptures and frescoes that should occupy a space three times the size. The faux marble columns put finishing touch on this epitome of camp. I had to go back to Cologne cathedral for another hour before the stained glass to regain my respect for the German people. The signs and marking are nearly non-exixtent. I found the visitor center, where the guided tours (only access) started by accident. tours are only in German, with english tape cassette available, all for 4 Euro. The Falkanburg was not marked or mapped anywhere. I gave up after wondering for an hour byodnthe garden. After visiting a fair few mediocre palaces whilst UNESCO hunting, these came as a welcome surprise, they were a lot more lavish than I expected them to be, and the level of decoration was very high. The high point of the two palaces inscribed is Balthasar Neuman’s staircase in Augustusburg, which is stunning. It is everything you expect of Rococo, massively over the top but impressive none the less. The level of decoration continues into many of the other rooms, and is consistently high. The formal gardens (pictured) and forest are very nice to walk around and lead you to the hunting lodge Falkenslust. On the way there as it was a national holiday in Germany there was a man demonstrating Falcon keeping, which added a nice authentic touch to the surroundings. The walk was very nice, though a little longer than I thought, but it helped to clear my hangover! Brühl is very close to Cologne about 20 minutes by train, and Augustusburg’s grounds begin on the other side of the road from the station, it was well worth the trip out from Cologne. The castles are closed on Mondays. It's a one hour drive away from the town I'm living in and so two friends and me went there spontaneously in February 2005. Of course the parks weren't full of flowers and the water in the ponds/fountains was frozen, but it anyway was amazing and didn't take away any of the castles' glance. Both castles are masterpieces of their kind! I enjoyed this castle and its smaller hunting lodge. When I was there, the lodge at Falkanhurst was open, although the exterior was being restored. The building was small enough that I could imaging actually living in it. The staircase walls are tiled in amazing blue and white patterns, all handmade and definitely worth looking at. It takes a few minutes to walk over to Falkanhurst from the main castle, but worth the walk (it's flat, through the formal gardens, a forest and then across some agricultural land). The main castle is only viewable on a tour. If you call ahead you can find out when they offer a tour in your language, or they have audioguides in different languages that you carry with you on the regular German tour. The staircase is pretty impressive, all Baroque and curly and ornate. One wing of the castle is used for exhibitions and performances, so you can schedule your visit around what's showing. We arranged a weekend in Cologne and hit this one, Aachen and the Cologne cathedral in one weekend. On a cold and very rainy day I took the subway out of Cologne to the small town of Brühl to tick off another WH site. The bad weather had one advantage - I had both palaces completely to myself. Apart from that, they are not particularly remarkable, and the 5-kilometre walk to Falkenlust and back was not really worth it. Augustusburg is a nice enough Baroque palace, but I have seen plenty of those already. There was an interesting exhibit on state visits to Germany, though, when I was there. When nearby Bonn was still the capital, all foreign heads of state were grandly received at Augustusburg. Now everything takes place in Berlin, and this palace once again enjoys its traditional tranquility. This castle is located in nice garden enviroment. 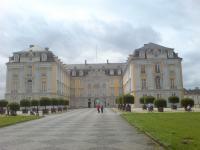 The castle Augustusburg is very luxurious, i was quite curious how could anyone had lived in such a place. Every room is different and quite kitsch - mixture of chinese ornaments with blue dutch tiles looks quite strange. Staircase is beautiful and very impressing. The music room has a nice story - the ruler ate there and the people were honored when they could look at him from the musicians balcony. There is a tour which takes about one hour and i had luck - it was in english. Falkenlust is about 20 minutes from main castle through the gardens. Unfortunately there is reservation needed for this.